So, you are running out of space… What do you do now? The first thoughts are often to find more space somewhere outside your existing building. You can consider options such as: Putting on an addition to your existing building; Renting storage containers for temporary use, Relocating to a larger facility; Using a logistics or fulfillment company to outsource a part of your operation to another location. All are reasonable options and one may be the best alternative for you. However, you should always evaluate the simplest and easiest option first. You should FIRST look at optimizing your existing space. There are very few warehouses, stockrooms and manufacturing facilities that are using their space to maximum efficiency and there are a few basic ideas that you can review quickly to see if there opportunities within your own facility to ‘find’ space that is not being used. It may look bad at first, but there are ways to find unused space in almost any building. Look at your slowest moving items and compare the profit generated from sales or use of these items to the cost of acquiring new storage space to keep them. Ask yourself “Would I build, buy, or rent new space just for these items?” If the answer is , “No,” consider selling these items at a discount or just disposing of them. Purchasing policies should be examined for opportunities to reduce on hand inventory by: reducing overstock levels; making smaller but more frequent purchases; or using vendor monitored just-in-time stock level programs. Newer software systems allow you store items in the most efficient manner, with similar sized items stored together, rather than using a strict numerical sequencing of products or category grouping. This allows you to maximize space utilization and have the software supply product location information for efficient order picking routes. 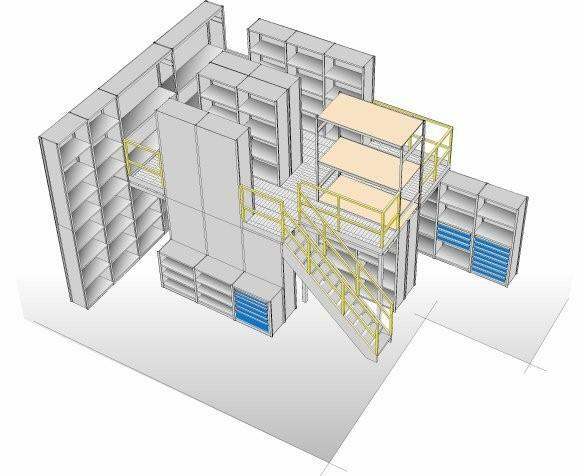 In many facilities there is unused space in the areas above stock room shelving, pick rack modules, assembly and packing areas, shipping and receiving docks, etc. Installing a mezzanine over these areas or extending the existing racks to higher levels can add significant usable space to your facility. The overall goal would be to increase storage density by looking for alternative storage options such as: closer shelf spacing; smaller bin storage sizes; converting from conventional shelving to drawer cabinets or drawers in shelving; using product specific racking for special items, etc. In upcoming posts, we will look at some of these ideas in more detail and offer specific ideas to help you create space where none seemed to exist before. So, you have decided to opt for maximum space utilization by organizing and storing your parts or inventory items by size, rather than in numerical order. This will allow you to customize the shelf spacing and the modular drawer heights for each group of components. But now, you think it may be harder to find items than it was when they were in straight numerical order. Well, let me help with some ideas that may actually decrease the time it takes to find items. First of all, we should all be using computers to help us track our inventory. There are many off the shelf inventory tracking programs that allow you to record item number, type, vendor, cost, stock levels and, most important for our purpose here, storage location. A simple data base can be created to serve the same purpose or even a spreadsheet with the key pieces of information. Once entered, the information in a spreadsheet can be sorted by part number, enabling you to look up the location of any part on screen or on a printout. Many software programs now allow you to print picking lists in location order, rather than by part number. Beyond using the computer, there are other ways to organize your components to minimize search time in your stock area. If you can obtain an analysis of your fastest moving items (your Top 20%), those items can be moved to the most convenient location for picking. These typically make up 80% of the active picks and you can reduce search and retrieval time considerably. You can group items by type, making it easier for workers to find items that way. 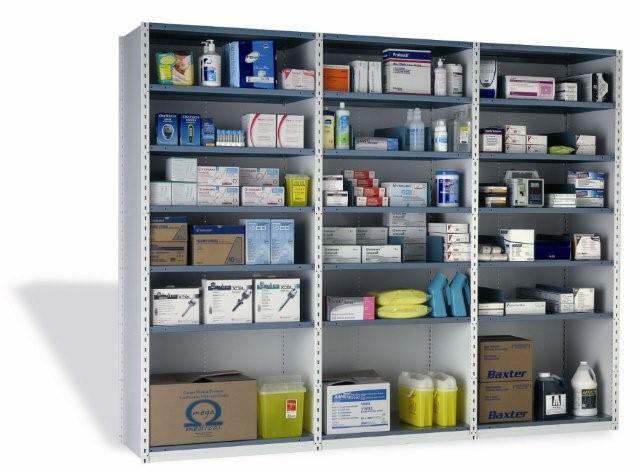 Shelving can be labeled or color coded to indicate the type of product. In modular drawer systems, each group of drawers, or even individual drawers, can be labeled or color coded by type for faster access to different product groups. Instead of organizing strictly by type, you can group by size and then type. For example, storing a group of bolts that can range from #6 (very tiny) to 1″ diameter (very big) in the same drawer or on the same shelf makes sense logically (keeping all the Bolts together), but not with respect to space efficiency. Storing all those tiny #6 bolts, along with their matching nuts, washers and lock washers together will be the most efficient use of space. The use of Drawers-in-Shelving can increase the number of items that can be stored in the same amount of space. Designing a drawer layout to match the size of the items you need to store will maximize the efficiency of your storage. More items in less space means less walking and less searching to find the right item. Keep in mind that every business operation is unique. These general guidelines can help you get started, but we encourage you to engage the people who will actually be working in this area to provide new ideas and feedback with their suggestions. Having everyone fully involved in implementing a new system will ensure a smoother implementation. Visit our website to learn more about 5s lean organization. How are your items arranged in your stockroom or warehouse? If you have a typical warehouse or stockroom, everything is arranged in order by part number. So, it’s easy to find everything, right? That’s great in the beginning, but as you add new items, increasing the number of items you store, and add new items that are ‘between’ two existing item numbers, then you begin to run out of room, are forced to rearrange item locations, and things start to get a little messy. Take a look at your shelving storage area now. If you use bins for storage of small items, look inside the bins. Do you see a lot of space in the bins? Do you see a lot of space above the bins or boxed items before the next shelf starts? Do you have larger and smaller items next to each other on the same shelf? These are all signs that you can save space and increase efficiency in your storage area. Now, consider storing parts by size, rather than in part number order, and you will maximize space utilization. Yes, we hear you… “But we’ve been doing it this way for years. How will anyone find anything if we change the order?” Trust us, there are ways to reorganize that will recover unused space and will still provide simple, logical and understandable location of all your items. Efficient parts storage begins with analyzing your product mix by size. Once you have an idea of what are small, medium, and large items (whatever that means in your business), you can begin to design a layout that will work more efficiently. Grouping small items in modular drawers or on tightly spaced shelves will save an enormous amount of space. This will leave space for more of the larger items grouped on shelves spaced further apart. Your storage will be more efficient, you will use less space and find it faster and easier to pick orders. For more ideas on how to keep track of all these changed locations and find your products easily, check out the second post in this series. 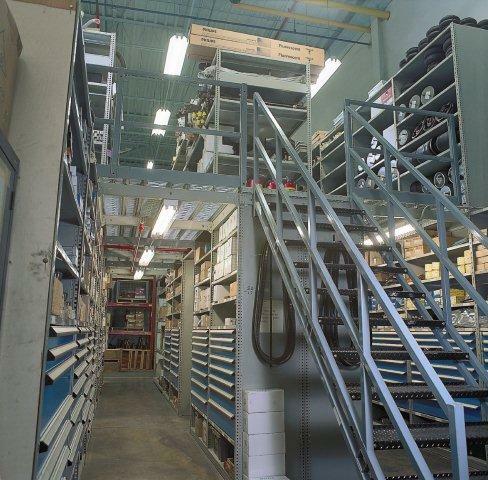 If you are planning for a small parts storage mezzanine in the future, here are a few easy and low cost steps you can take now to minimize the extra costs and impact to your operations in the future. The first consideration is capacity. 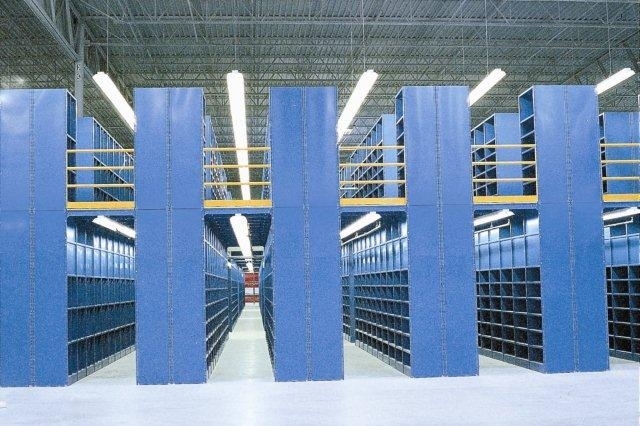 A shelving or rack system may be adequate for a single level system, but when a second level of storage is added, the upright post or frame capacities may not be sufficient to support the load on the second level. This can be addressed in two ways. First, ensure that the posts or uprights you install on the lower level, and the factory recommended sway bracing, will be adequate for the capacities you need when the second level is added. 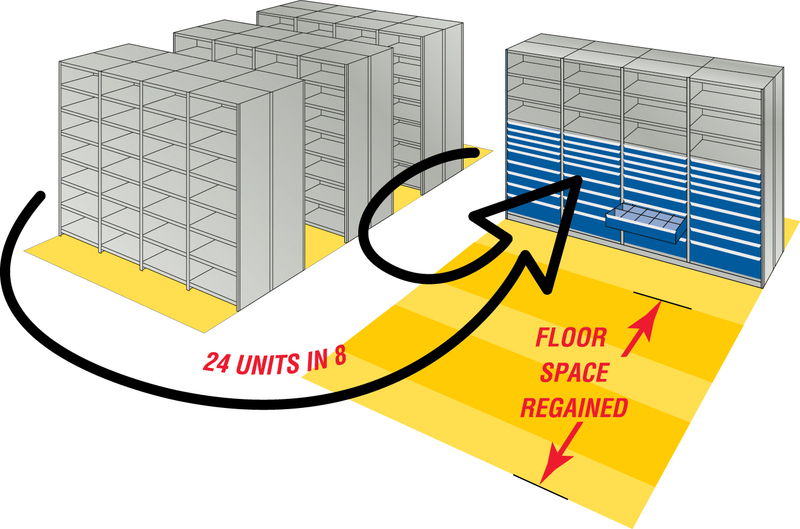 Second, the spaces between the rack or shelf levels will affect the capacity of the uprights: the closer the shelf spacing, the higher the capacity of the uprights up to their maximum capacity. Therefore ensure that shelf spacing used on the lower levels is close enough to guarantee the required capacity, or, plan to add these extra shelf levels when the upper level mezzanine is added in the future. The next concern comes extending the upright posts or frames to accommodate the second level. The second level posts are usually joined to the lower level posts with a factory approved splice kit. So, if you installed 7’ high shelving, you will have to remove the top shelf, install the splice and effectively reduce your storage capacity on the lower level. To avoid this situation, you can install higher posts than you need during the initial lower level installation. Then, when the time comes to install the second level, there is free post extending beyond your top shelf where the splice can be installed. The second floor can then be installed below the splice without affecting any of the existing shelves on the lower level. This option can be used with bulk rack, shelving or rivet rack applications. The last two problems that you can avoid with a little planning are: floor anchoring and aisle spacing. Shelving supported mezzanines require the lower level posts to be fastened to the floor. This is very difficult to do after the shelving has been installed, usually requiring the emptying and removal of all the lower shelves to get access to the post bases. (Hopefully, those posts have floor shoes already installed to accept the floor anchors.) Then those lower shelves are re-installed and reloaded. This represents a significant investment in time and money. So, for a small additional cost per unit, you can install floor anchors in all the shelving units on the lower level in the first installation and avoid the higher cost later. The last recommendation is to install row ties at the top of all the shelving units on the lower level. 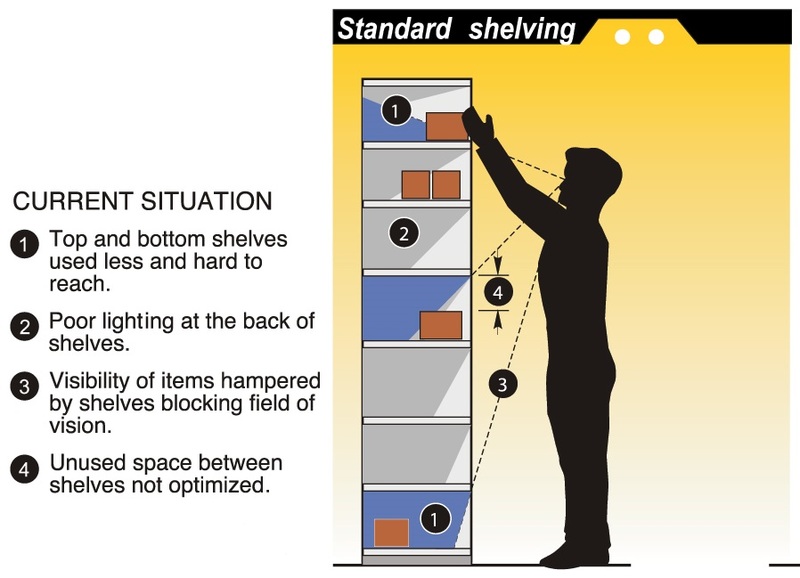 Over time, usage from loading & unloading and the occasional ‘bump’ from a cart or truck may cause shelving rows to become misaligned or to get out of vertical. Installing row ties ensures that all the rows are straight and none of the individual units are out of alignment. It also maintains a consistent spacing between the shelving units. Then, the flooring for the second level can be sized to easily fit in each row and no expensive custom cutting or fitting will be required during the installation process. Accordingly if a mezzanine is in your future, take these few simple and inexpensive steps now to ensure a smooth and cost efficient transition to a two-level storage system in the future. The New Year is a good time to resolve to have a safe & efficient storage area. One aspect of safety in your facility is equipment inspections. It is important for you to inspect your storage shelving and racks every year for damage. Even minor damage to uprights or shelves can seriously weaken their storage capacity. The easiest way to conduct an inspection is to have a form with all of your bin or rack locations printed on it. Then you can walk your stockroom or warehouse and note any damage by location code. Plumb & Level: All rack stability depends on the rack uprights being installed in a true vertical position and the cross beams & shelves being level. Note any evidence of racks being crooked, out of alignment in the row, or leaning from vertical in any direction. Typical allowance would be 1/2″ in 10′ of height. You may need to install or repair sway bracing on those units that are more than 1/2″ out of plumb. Rust & Corrosion: Note any areas of rust, flaking paint, or corrosion on the rack uprights or beams. This may indicate a weakening of the metal in that area. Be extra careful with inspections in damp areas or where flooding has occurred, or where freezers or coolers create a chance for condensation. Upright Column Damage: Check horizontal and diagonal braces for bending or damage. Check footplates and floor lags for secure attachment to floor. Note any upright posts that are twisted, dented, punctured, or buckled. Damage to the upright column can significantly reduce the capacity of that entire section of racking. Damaged uprights should be repaired or replaced immediately. Overloaded Shelves & Beams: This can be a difficult issue. Most storage shelving and racks are not marked with capacities for the uprights, beams or shelves. This can lead to overloading as your product mix changes or racks are reassigned for use in a different application. If you are not sure of the capacity of your shelving or racks, contact your supplier or the manufacturer for the specifications for you equipment. Note any shelves that are deflecting (bowing) in the center or have a permanent kink in the front edge of the shelf. If the shelf does not return to a straight and level condition after unloading the shelf, it should be replaced or reinforced with angle iron. Check the beams in all rack sections for deflection. The deflection should not be more than 1/180 of the length of the beam. That is about 1/2” deflection for an 8’ long beam at the maximum load. In addition, the beam should return to a straight condition with no deflection when the load is removed. If it does not return to level, then the beam has been permanently deflected by previous overloading and should be replaced. Inspect the beam connections where they attach to the upright frame. Note any impact damage to the face of the beam, cracked or broken welds on the beam clip, or distortion or damage to the holes in the upright frame where the beam attaches. Replace any damaged components. Missing Safety Pins, Clips or Bolts: Shelving and Racks use a wide variety of connection methods. Some shelves and beams bolt in place, some clip into the upright, some have the beams attached to a clip that hooks into the upright and some use a combination of clips and bolts. You should know the recommended attachment method for your brand or brands of storage shelving and rack. Ensure that all beams are securely fastened into the upright. On bulk racking, in addition to the main beam attachment, there should be a safety pin, clip or bolt that prevents the beam from being accidentally dislodged from its connection to the upright frame. Note any missing nuts or bolts on rack connections and check to be sure all nuts and bolts are securely fastened. Note any beams where the safety pin or clip is missing or damaged. Missing or damaged hardware should be replaced immediately. In addition to the items listed above for regular inspection, there are some general safety measures that can be employed to supplement the regular inspections and increase overall safety in your facility. General Safety Procedures to be implemented along with regular inspections. Employee Awareness: All employees working with and around the storage equipment should be made aware of the potential problems listed above and notify their supervisor if they discover an unsafe condition. Posted Capacities: Post the shelf capacities for all areas in your system. This will help avoid overloading the shelf levels. Post the upright frame capacity for the rack system. The total of all the shelf capacities in a section should not exceed the rated capacity of the upright frame. Be advised that the total upright post or frame capacity is not a fixed number and varies with the spacing of the shelf levels. Upright capacity decreases as the vertical space between the shelf levels increases. In other words, the closer your shelf levels, the closer you get to the maximum capacity of the upright frame; the greater the space between your beam levels, the more the upright frame capacity is reduced from the maximum capacity. Call us or email if you have any questions about Rousseau shelving and bulk racking.